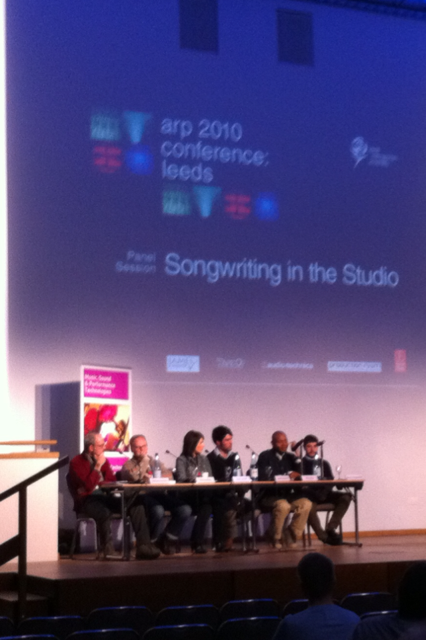 For the final part of day 2 of the ARP conference there’s a session called Songwriting In The Studio. The panel consists of Richard Formby; Phil Harding; James Kenosha, Paul Miller (aka DJ Spooky) and Marco Pasquariello. Paul is up first and he plays us some of his film score music consisting almost entirely of programmed samples. He discusses why he took a ‘cover version’ approach rather than sampling original recordings, and the various copyright, aesthetic and technical parameters that led him through those creative decisions. Like most of the panel, Phil (who as you’ll see from his biog worked extensively with Stock, Aitken and Waterman) sees little distinction between songwriting and production (in that songs are written in the studio), but he also interestingly describes producers as a ‘service industry’. He tells us of SAW’s shameless theft of titles (which of course is not illegal in any way! ), in this case from the US hot 100 charts of the 1980s. If you’re interested to find out more I can recommend Phil’s book about the PWL days, available here in its new edition. Phil gives us a fascinating insight into the way SAW built tracks by analysing existing songs’ structure/form and other musical characteristics and then applying them to new works – a ‘hit factory’ in the literal sense! Phil plays us a song called I Need You by 90s pop band Deuce. Phil tells us that the first melodic line of the chorus was shamelessly stolen from Cecilia by Paul Simon (he only infringes two notes actually so I’m not sure it’s theft in any legally meaningful sense – although when you know this is the source it’s very clear which part is the ‘tribute’). But like many of the papers at this conference connected with mashups/co-writes/sampling etc, it raises lots of interesting questions about ownership, creativity and originality that are simultaneously philosophical, legal and artistic. Marco Pasquariello is talking about the Blue Roses track Doubtful Comforts, together with some lovely anecdotes about lo-fi recording, including grinding up 1/4 inch tape in the garden and buying an afternoon of time in a music shop in order to record all the pianos. He makes some equally interesting points about the deliberate constraints of some projects (for example, using eBows as the main instrumental pitch source). Richard Formby starts with a ‘process piece’ called Tuning up for Piano which he created by running a recording several times while a piano tuner was working, then putting all the takes together as a multi-track – resulting in a very charming piece of chance-music. He admits to stealing small fragments of drums from bands in his studio (sometimes he tells them, sometimes not!) for use in his own music. There follows a discussion about out-takes (inevitably the Troggs tape is mentioned). In the Q&A session, Paul makes the interesting point about the rebirth of the single; “since downloading […] very few people seem to like whole albums any more”. We also get briefly into the debate of ‘what is a song’ and whose creative contributions constitute ‘songwriting’.